There is an outstanding number of texts available on the study of the Holocaust. Books are available in all age ranges, education levels, languages, and perspectives. To narrow a list to simply ten on such a well-documented and important topic is difficult; bordering on impossible. The texts on this list combine to create an excellent and comprehensive history of the Holocaust; its origins, place within the war, practices, aftermath, and lasting effect on humanity. Starting with these ten, and utilizing the detailed notes and bibliographies contained within, a provocative study of one of the greatest atrocities in human history can begin. 1) Omer Bartov, Germany’s War and the Holocaust: Disputed Histories (Ithaca, NY: Cornell University Press, 2003). This analytical text serves as a remarkable introduction to Holocaust studies. Bartov offers revisionist interpretations of the role played by the Wehrmacht and the German tactics of war, such as the blitzkrieg, as a means by which to conceal German extermination practices. Further, this book examines the introspection of German citizens at the time of World War II, post-war changes in America, and the atmosphere of fear that permeated Europe during the war. In order to fully understand the events of the Holocaust, one must comprehend the circumstances surrounding the Second World War and the pervasive theories of race propagated by Hitler's regime. Bartov does an excellent job of offering a survey of the war and explains in detail, from different perspectives, the origins of the Reich's policies concerning the Holocaust. 2) Roger Griffin, ed., Fascism (New York: Oxford University Press, 2009). Aside from a basic knowledge of World War II, understanding the basics tenets of fascism is essential to understanding the genocide of the Holocaust. Griffin compiles a provocative collection of primary sources in the form of propaganda articles, essays, and the text of speeches given by prominent leaders of fascism. The reader is not limited to Hitler's as it is broken down by time period and country. The books moves from the fascist movement in Italy that began in the 1920s to the rise of Nazism in Germany in the 1930s. Other fascist movements are included, however; for the purpose of Holocaust studies, the one hundred-fifty pages devoted to Germany’s movement is essential to understanding how the Holocaust unfolded. Included are texts of speeches and articles written by Goering, Goebbels, Hitler, and Himmler. The lesser known writings are of equal importance as the Holocaust was not one single event, rather it was a process that grew over a decade. For example, Walter Gross, the 1933 director of the Office for Education in Demographic Politics and Maintenance of the Race, penned an article in 1941 entitled, “Improving the Stock,” wherein he describes the “defective elements” of “racial hygiene” in order to justify the eugenics programs already in place prior to the death camps. He discusses the “definitive elimination of parasites [Jews]” that Heydrich termed the Final Solution a year later at the Wannsee Conference. Understanding what happened at places such as Auschwitz is less important than understanding why such atrocities happened at all. 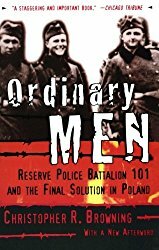 3) Christopher R. Browning, Ordinary Men: Reserve Police Battalion 101 and the Final Solution in Poland (New York: Harper Perennial, 1998). This work is so important in that it reminds students, and established historians alike, that not all Germans supported genocide. The German war machine pulled this group, and many others, into the Holocaust. These men were not conscripted into military service to fight a war on behalf of their country, they were activated as a police battalion tasked with murdering other ordinary citizens, who just happened to be Jewish. Browning, therefore, not only details their actions, he also studies this group through a psychological lens as individual men asked to do what was previously deemed unthinkable. Critical readers will find this book indispensable and it is recommended to all students of the Holocaust and can be used in the discourse of any genocidal study. 4) Christopher R. Browning, The Origins of the Final Solution: The Evolution of N azi Jewish Policy, September 1939-March 1942 (Lincoln: University of Nebraska Press, 2004). Christopher Browning produced yet another essential analysis of the Holocaust. Specific in scope, this book illustrates what took place during the crucial time between the German invasion of Poland and the onset of mass transportation of Jews to death camps. After Germany conquered Poland, nearly two million additional Jews fell under the Reich's control. This meticulous work, in both research and analysis, traces Hitler's plan of extermination from ethnic cleansing to mass murder. Further, it highlights the importance of Poland as an ersatz training ground for genocide. This book is perhaps best suited to the advanced scholar who has limited her area of study. The notes and bibliography will prompt the student to further study the structure of the Holocaust. 5) Mark Roseman, The Wannsee Conference and the Final Solution: A Reconsideration (New York: Picador, 2002). This book is included on the list as it is a slim volume that provides a detailed overview of what transpired during the meeting. Roseman does not provide anything new or groundbreaking, rather this book is important as it is accessible to the casual student of the Holocaust. As with any literature, without an audience, it is purposeless. Politics has become more polarized as of late. Social media and scant histories have spread inaccuracies as to the truth of the past. It is important in this age that scholastic works be more widely cited than social media sites. Therefore, Roseman’s work is ideal to put forth facts regarding the infamous Wannsee Conference where the Final Solution was decided and authorized. Importantly, the one surviving copy of the minutes of the meeting are copied in the end of the text. It is imperative to understand the outcome of this meeting if one is to fully comprehend the events of the Holocaust. 6) Richard Plant, The Pink Triangle: The Nazi War Against Homosexuals (New York: Henry Holt & Company, 1986). Although three decades old, The Pink Triangle is an important work in that it deals with a non-Jewish group that was targeted for genocide. Plant adequately covers the homosexual community in Berlin prior to the Nazi rise to power. He then takes the reader chronologically through the effects of the eugenics programs on homosexuals, the sterilization of gay men, and eventual confinement in work and death camps. Interestingly, this book illustrates Hitler’s seemingly indifferent attitude towards homosexuality. Rather, Himmler was primarily responsible for enforcing Germany’s anti-homosexual laws. At the crux of Plant’s argument is that specifically male homosexuality was a deterrent to propagating a pure Aryan race. Two million German men were lost during the Great War and the Second World War was taking even more. Additionally, it was estimated that two million more of German men were homosexual, thereby causing a tremendous delay in the propagation of a pure race. This pronatalism thesis coupled with a detailed look at what the life of a homosexual was like under Hitler's rule, makes this an important study of the Holocaust. 7) Laurence Rees, Auschwitz: A New History (New York: Public Affairs, 2006). Rees produces an intricate and provocative look at the daily workings of the most infamous Nazi death camp. He not only details the horrific medical experiments conducted by the notorious Dr. Mengele, Rees also illustrates the daily routine of the camp. What makes this book so compelling is that the information is attained through interviews with both the survivors and the perpetrators of the crimes committed in the camp. 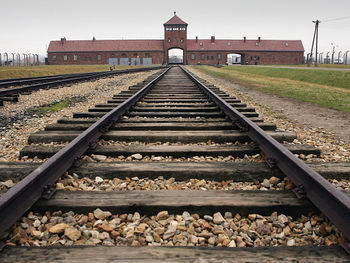 Auschwitz became an efficient killing factory and still today is the most significant physical reminder of the Holocaust. This book is essential to any serious study of genocide, World War II, and the human condition. 8) Gisella Perl, I Was a Doctor in Auschwitz (1948; repr., North Stratford, NH: Ayer Company, 2007). Dr. Gisella Perl was a practicing obstetrician in Hungary when the Second World War commenced. She was also Jewish. By 1944, she and her family (as was her entire village) were violently forced from their homes and transported to Auschwitz. I Was a Doctor in Auschwitz is a painful first-hand account of this brilliant physician’s actions during her time of imprisonment. As she was an OB/GYN, Dr. Mengele compelled her to be witness to and participate in his medical experiments on twins and pregnant mothers. 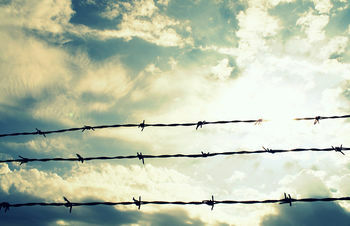 Further, she was allowed to act as a physician for the prisoners where she was required to make unthinkable choices. Dr. Perl was a victim of the Holocaust, yet due to her mandatory involvement with Dr. Mengele, she was seen by some of her fellow inmates as a perpetrator. This is an excellent memoir of this instance of genocide and challenges the reader towards introspection. As opposed to being viewed as either good or evil, as is the case with most personal accounts of the Holocaust, Perl’s narrative questions the morality of survival. This text is not only an excellent read, it is also an indispensable teaching tool for all levels of study. 9) Anne Frank, The Diary of a Young Girl, eds., Otto H. Frank and Mirjam Pressler, trans. Susan Massotty (New York: Bantam Books, 1997). 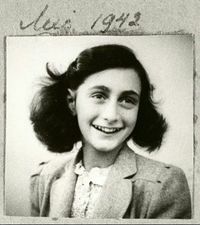 Anne Frank died in March 1945 at Bergen-Belsen, just three months before her sixteenth birthday; one month before the liberation of the camp. The diary she left behind is the tale of a typical teenaged girl, who lived in a very untypical time. This book begins with her first entry on June 12, 1942 and ends on August 1, 1944; three days before she and the others in hiding were taken by the SS to prison, en route to Auschwitz. The Frank diary is heartbreaking in that prior to her life in hiding, Anne wrote about her family life, school, friends, and love. Amazingly, she continued to write with optimism through her time in hiding and maintained the air of a whimsical teenaged girl. There is an ominous shade over the text as the reader is aware of the girl’s fate. Her fresh, smiling face is indelibly imprinted on one’s mind even as Anne is transported to the death camps. Her story is a remarkable testament to the human spirit and prompts the reader to imagine what her future might have held. Anne Frank’s Diary can be read and taught from elementary school through graduate school. 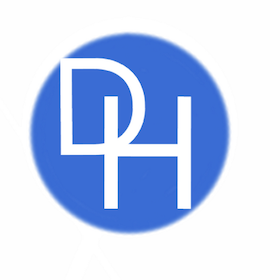 It is an indispensable tool for teachers of history, psychology, sociology, literature, and numerous forms of cultural studies. 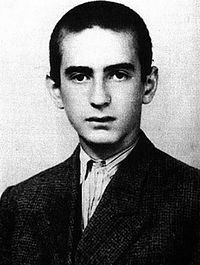 Elie Wiesel age 15, 1943. 10) Elie Wiesel,Night, trans., Marion Wiesel (1958; repr., New York: Hill and Wang, 2006). No criticism can be brought upon this brilliant work. Elie Wiesel was a teenage boy when he endured the horrors of Auschwitz and Buchenwald with his father. Wiesel not only recounts the daily atrocities and unfathomable events he witnessed, such as the beating death of his father, he also illustrates his own transformation as a devout Jew and human being. What happens to faith in the context of the Holocaust? How does one recover? What happens to the hate? Wiesel confronts these questions as both a sixteen year old boy and grown man. Not much need be said to advocate for this masterpiece to be included in the Holocaust canon. The slim one hundred page text is both the beginning and end of a semester of study in various disciplines. Indispensable.